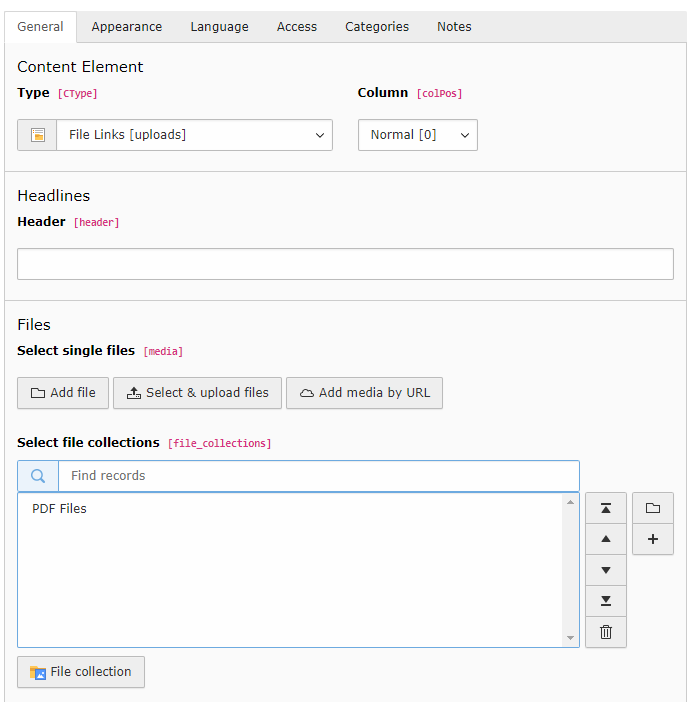 Since TYPO3 CMS 4.7 there exists a generic interface for managing collections of records. The File Abstraction Layer itself extends this mechanism for managing file collections. Record collections are managed via the TYPO3 backend. They can only be created in Folders. In the above image, the third record in the collection is actually a page. This will be ignored in all process using the Collections API, because the chosen table prevails. Record collections are stored in the "sys_collection" table. The selected records are stored in the "sys_collection_entries" table. Record collections can also have a type. Only the "static" type exits so far. Others might be added in the future. File collections are similar in principle, but reference files. They are used by the "File links" (download) content element. 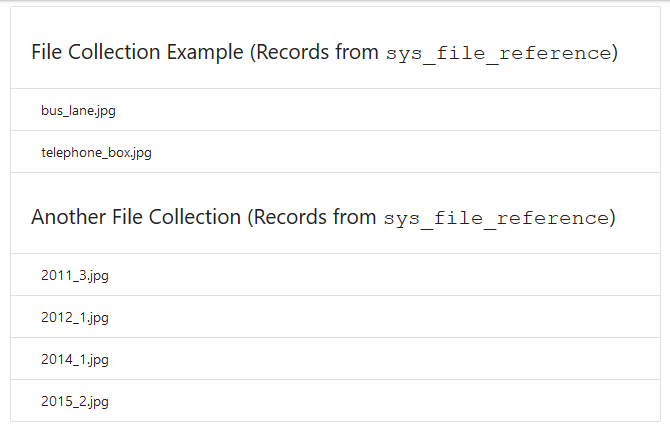 File collections are stored in the "sys_file_collection" table. The selected files are stored in the "sys_file_reference" table. Note that a file collection may also reference a folder, in which case all files inside the folder will be returned when calling that collection. Used to retrieve collections. It's not exactly an Extbase repository but functions in a similar way. The default "find" methods refer to the "sys_collection" table and will fetch "static"-type collections. Method findByTypeAndTableName() makes it possible to fetch collections from other tables and of a different type. This class models the static record collection. 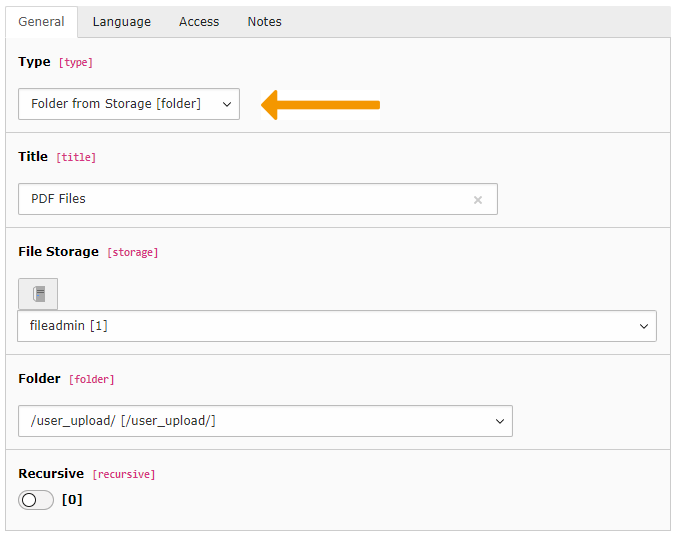 It is important to note that collections returned by the repository (described above) are "empty". If you need to access their records, you need to load them first, using method loadContents(). On top of some specific API methods, this class includes all setters and getters that you may need to access the collection's data. For accessing the selected records, just loop on the collection (see example). Similar to the record collection repository, but for file collections. Similar to the static record collection, but for files. Again similar, but for file collections based on a folder. File collection based on a single category. The base is code is quite simple: all collections are fetched and passed to the view. The one specific step is the loop over all collections to load their referenced records. Remember that a collection is otherwise "empty". Note that the above code is a bit rough as it assumes that each record has a "title" property. This may of course not be the case and proper checks should be made. Typical output from the "Collections" plugin of extension "examples"